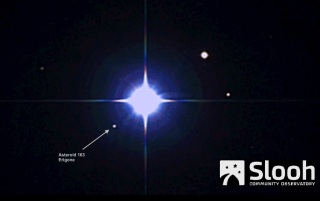 The huge asteroid 163 Erigone passed in front of Regulus, blotting out the bright star Regulus for a few seconds for viewers in North America. Here, the asteroid can be seen nearing the occultation as viewed by a Slooh online community telescope. Image uploaded March 20, 2014. NASA is enlisting amateur astronomers to hunt for killer space rocks in Earth's cosmic neighborhood. The space agency announced Wednesday (May 21) that it has signed a deal with the online Slooh community telescope to get citizen scientists involved in tracking near-Earth asteroids. NASA's Asteroid Grand Challenge, which was unveiled last June, is an effort to find potentially deadly space rocks before they pose a threat to Earth. Slooh and NASA will discuss their partnership during live broadcasts on Friday (May 23) during a webcast on the journey of Comet 209P/LINEAR at 6 p.m. EDT (2200 GMT). They will host a webcast on the potential meteor shower it might create 11 p.m. EDT (0200 May 24 GMT). The broadcasts will be available on both Slooh.com website and NASA.gov. So far, scientists have catalogued more than 90 percent of the mountain-sized near-Earth asteroids, or objects wider than 0.6 miles (1 km), according to NASA's estimates. Space rocks of this size could cause destruction on a global scale if they were to collide with Earth. Smaller space rocks are more elusive. Only about 30 percent of the estimated 15,000 near-Earth asteroids that are around 460 feet (140 m) wide have been found, NASA officials say. Meanwhile, there are believed to be more than 1 million near-Earth objects with a diameter of about 100 feet (30 m); less than 1 percent of those have been detected, NASA estimates. "Discovering near-Earth asteroids has become an automatic process for the survey telescopes, but discovery is just the beginning — there is so much science to do after that," Jose Luis Galache of the Minor Planet Center, said in a statement. "Amateur astronomers with access to pro-level telescopes under dark skies are in a great position to learn more about an asteroid than just where it's going." This isn't NASA's first asteroid-hunting endeavor to look to the public for help. In partnership with the private company Planetary Resources, NASA in March launched a contest series called "Asteroid Data Hunter," which asks citizen scientists to develop algorithms that can help identify space rocks in Earth's backyard. The contest series, which runs through August, has a total of $35,000 in awards available.